A Mant is a large arthropod with four pairs of limbs. The first pair of limbs are modified into grasping and manipulating arms, while the remaining three pairs are used as legs. The Mant's thorax is elongated into a torso that can be held upright, with the arms emerging from roughly the position of shoulders, but facing forward rather than to the side. If threatened, the Mant will rise up on its rear two pairs of legs and use its front leg pair to deliver powerful blows. Mants are covered by a hard exoskeleton that protects them from minor injury. The exoskeleton is blue with pink or purple extremities, individuals from some hives are freckled with brown spots. A Mant's head sits atop a highly mobile neck, and can turn nearly 180°. Two eye-paddles protrude from the head on short stalks. Behind each eye paddle are two iridescent panels used for visual signaling. These are fairly mobile, and can fold back or spread forward. The front panel colors can dim to a dull slate color or brighten to rainbow hues, the backs of the panel are the same color as the rest of the Mant's exoskeleton. Mants may have acquired their name from a contraction of "man-ant" because they are hard working and live in ant-like colonies; or possibly because they resemble giant mantises. 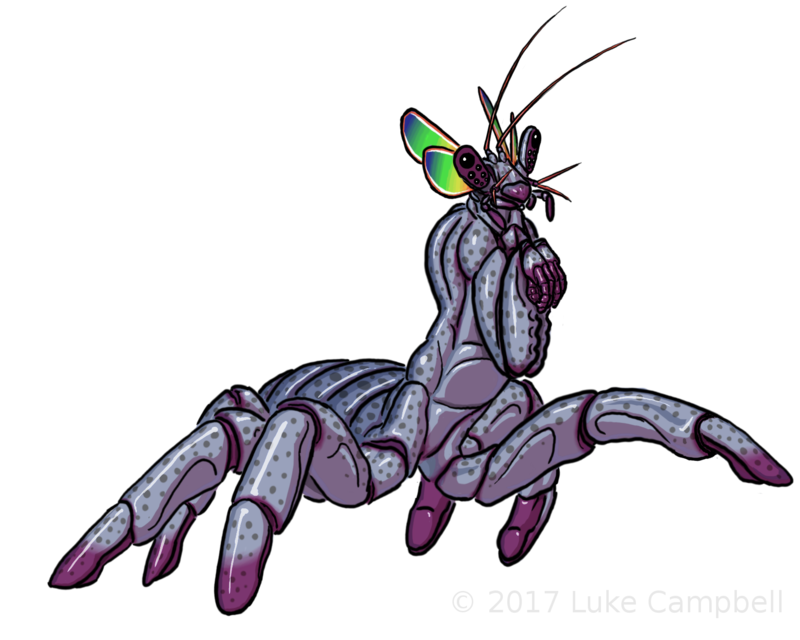 Note: Mants are true arthropods, descended from the ur-arthropods introduced to Mantheim during the panspermia radiation caused by the Antecessors, 18 petaseconds (560 million years) ago. 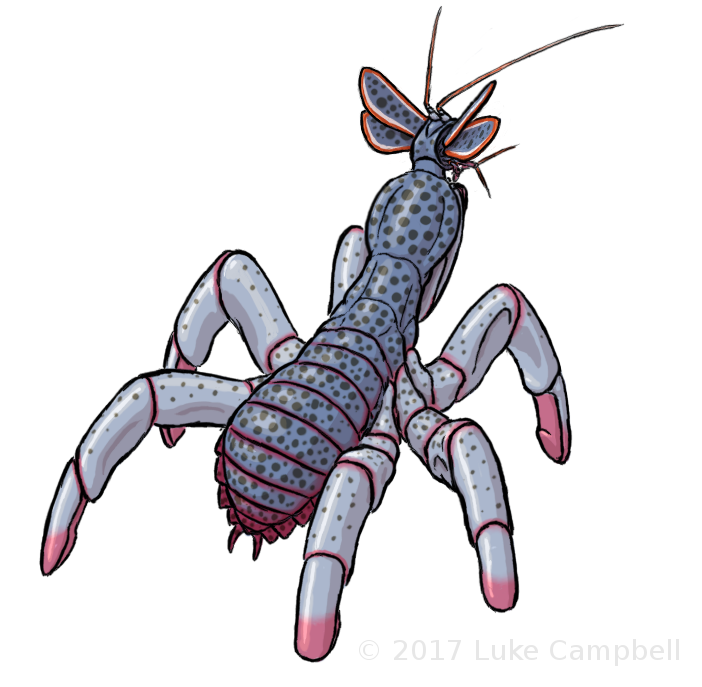 Unlike Earth arthropods, they have evolved a closed circulatory system and efficient respiration with lung-like organs, and are mesotherms with much higher metabolism than the insects and spiders we are familiar with. Mants breathe by rhythmic flexing of their abdomen like a set of bellows, forcing air through spiracles into the Mant's lungs and then back out again. The abdomen also contains the Mant's digestive system and the line of multiple hearts that pump its blood. The thorax of a Mant houses its brain and one of its hearts, but is mostly taken up by muscle. All of its major limbs connect to the thorax, even though many of the legs reach back under the abdomen. Each of a Mant's eye paddles has one primary eye providing high resolution vision, and six smaller eyes for wide angle vision. The stalks allow the paddles to turn to see in nearly any direction. When a Mant notices something that interests it, it will focus both of its primary eyes on it for binocular vision. The antennae of a Mant are multi-purpose sensors, giving the Mant information on odor, taste, humidity, orientation, motion, and air currents. The Mant's sense of smell is exquisite, and used to relay social cues and simple messages as well as identify objects and alert the Mant to the presence of objects. Mants hear using tympanic membranes in the expanded disk-like portion of their upper thorax. Mant hearing is roughly equivalent to that of a human, although slightly better at hearing in the lower registers. A sample of Mantspeak script from the Sacred Library, inscribed on traditional writing tiles, concerning the proper behavior of an obedient servant. Mant speech does not translate well to human ears or writing systems; they use a series of droning hums and buzzes, clicks, and chirps for audial communication. The Mant vocal stridulations are made by scraping specialized parts of their abdominal plates past each other, so the abdomen of a speaking Mant flexes or moves in and out slightly. Mant speech sounds cannot meaningfully be described by the Latin alphabet nor comfortably spoken by a Human larynx (although there is often an attempt to make a phonetic translation, with variable results). This is why Humans got to make up their own name for the Mants rather than using what they call themselves. With some practice, Humans and Mants can make noises which sound enough like each others' language to allow mutual comprehension with a fair amount of effort on the part of the speaker and listener. It is often easier for the Mant to just learn to understand the Human's language without speaking it and vice versa, allowing both to speak in their native language and be comprehended by the other. Usually, Mants on Human worlds rely on computer translators to communicate. Mants signal to each other with scent marks, clouds, and trails. These can be used to deliver simple messages to those who smell them, or to lay trails that are simple to track. They also use their head panels to visually communicate moods. Mants use reading and writing to communicate complex ideas across times and distances where speech is impractical. Mant travelers, diplomats, scholars and immigrants to the Human Verge have little trouble learning to read or write Human languages. Traditionally, non-gendered Mants are referred to with the male pronoun in Human languages - "he" or "him" in English, 他 in hànzì, "él" in Spanish, and so forth. Mantspeak: The primary language of the Zox Mants is called Mantspeak by Humans. It's buzzes, clicks, and chirps are difficult for other species to reproduce without mechanical assistance or computer translation, but non-Mants can learn to understand mantspeak when spoken by a Mant. There are no other known native Mant languages. It is thought that all the other languages of Mantheim were eradicated when the Zox assimilated or genocided the Mant cultures they conquered. 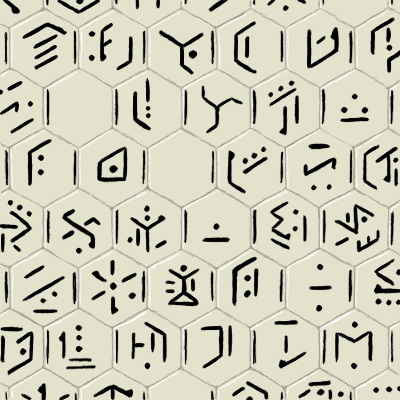 Mantspeak writing uses lines and dots on a hexagonal tiling. The position of each dot and position and orientation of each line indicates a sound, the latter can be modified by flags at the ends of lines. The sounds of each tile are grouped together to make words. A bar on the side of each tile indicates the position of the next tile in the sequence to be read, meaning that tiles can be arranged with the writing read in any direction. Commonly, however, the writing simply scans in lines back and forth along one tiling direction, skiping over a line at the end of the block of tiles. Complicated reading patterns, however, are common in Mant poetry, puzzles, and artwork. Mantspeak modifies words to indicate grammar rather than word placement in a sentance. Consequently, native Mantspeak speakers often end up using words out of order in Human languages that rely on word order. Computer translators fix word order automatically, so this is not usually an issue except with those Mants that go the extra mile to learn to reproduce Human sounds. Mants are omnivores, capable of eating many types of biological tissues. Food is normally treated by soaking it in enzymes to partially pre-digest it - a task traditionally carried out by certain strains of domesticated fungus that would grow over food set out for preparation. Food designed for rapid preparation is usually ground up into a fine meal or mush, to allow the enzymes to act faster. Some Mants living in contact with Humans come to appreciate cooked food, while others continue to find it repulsive. Reproduction is the responsibility of one or a few individuals within a hive. They lay tennis-ball sized eggs which hatch into young that look like tiny versions of an adult Mant. Young Mants are cared for and educated in a creche. Most Mants are clones of their parent; these young are selected for duties within their hive based on aptitudes that reveal themselves as they develop. Those Mants which result from a sexual union – called drones – are expected to leave their hive when mature and found their own hive; these are trained in the skills needed to survive on their own and establish a household. These child hives are usually strong allies with their parent hive and their hive siblings. If the reproducers of a hive die or are rendered sterile, other Mants from within the hive can take their place. This requires several megaseconds (tens of days), during which the selected Mants are exposed to pheromones and other stimuli to encourage the maturation of their reproductive organs and become either male or female. A Mant's main motivation is to the success and well-being of its hive, and to this end it will work with a remarkable drive and dedication. Individual members of the hive are not critical - they have a Mant's support insofar as they are necessary for the broader success of the group, but can be sacrificed if needed for the greater good; and the Mant expects those sacrificed to recognize and accept this. Nonetheless, they can make friends both within and outside their hive who they prefer to interact with. Under exceptional circumstances, a Mant can transfer its loyalty to an organization other than its birth hive. Betrayal by the hive is not one of these circumstances - the Mant puts little value on its own life and well-being, and it expects to be left behind or thrown under the bus if it benefits its hive. Rather, prolonged isolation from its hive, the destruction of most of the hive (including the central "core" of individuals who give it its own unique identity and character), or being raised from birth in a different social setting can achieve this transfer of loyalty. Mants prefer a harmonious and well-ordered environment, moving along predictable patterns with a clear understanding of their place and what they should be doing. A Mant will want to know its duties and responsibilities, when it can exercise authority and over whom, who has authority over it and in what circumstances, and the standard protocols, rules, and regulations that it must follow. Change makes Mants nervous; big changes that threaten to undermine society terrify them. Mere strangeness or unusual beings do not bother Mants, it requires a threat of change to established routines, the natural order of things, or society. If a Mant senses that things are irrevocably falling apart and there is nothing it can do to change this, it may become confused and indecisive until it can find its place in the grand scheme of things once again. Drones are the natural rebels of Mant society. Better able to handle uncertainty and ambiguity, they are equipped with the mindset to leave their home hive and make a future for themselves and their progeny. Mant society is based around the hive, a group of a few hundred genetically identical Mants when fully mature. Each hive is a closely knit group that works together with a common purpose towards goals set by their leaders. The broader Mant society arises when hives interact with each other, cooperating and competing, trading and making alliances and fighting. In any Mant civilization, laws will govern the relations between the hives. The current major Mant government is the colonial authority of the Zox Hierate for the Milky Way. The Zox Hierate is (or was) an expansive galaxy spanning empire from Triangulum that established a foothold in the Milky Way, where they met Humans and Gummis. The Zox believe that society should follow on the large scale the patterns of the hive on the small scale. Hives should exhibit unflinching devotion to the Hierate, with empire-wide direction made by a small group of decision maker hives (including the imperial hive, who founded the Zox) delegating authority to sector governors and continuing in a fractal pattern reaching to the local level. Their history has led them to believe that all knowledge can be found in the science of the Antecessors and the teachings of long-dead Mant philosophers from near the beginning of the Hierate. Consequently, they tend to reject new ideas and scientific findings, and look to established tradition and age-old regulations for their answers. The Hierate has excellent methods of indoctrination (for Mants, at least), leading to a near universal acceptance of their orthodoxy within Zox-controlled space. Mants of the Zox place much emphasis on the honor of their hive. The appearance of correctness is more important than results, and displaying ignorance, weakness, or failure can lead to shame for one's entire hive. Respect given to one's hive is of the utmost importance. Therefore, it is better to remain silent than ask questions; to play it safe than to take risks; and to sugar-coat the truth or outright provide incorrect information that the Mant thinks a superior hive wants to hear - especially if the correct information would reflect badly on its hive's competence to carry out its assigned duties. Not all Mants are this hidebound. Immigrants and refugees in the Human or Gummi occupied regions of the Verge will retain their old attitudes for some time, but the next generation of hives will adapt to the attitudes and customs of their neighbors and become more flexible in their methods. Even the original hive of immigrants may, over time, adapt as the old members of the hive die off and their young mature - but this takes considerably more time since the hive itself is responsible for education of its young. Mants build structures based on hexagonal tiling. An entire Mant hive will be housed in one building. Each Mant will have its own cubbyhole – a vertical honeycomb cell in which it sleeps and rests, entered from above. The level above the sleeping cubbies is used as part of the Mant hive's common area. A hive building may have multiple levels of this nature, with larger areas for communal dining, work space, and storage. Mant structures are usually excavated from the ground, with ventilation towers rising into the air. Mants appreciate bright colors. Much of their art uses garish or iridescent colors, as well as glowing elements provided by artificial lighting. The staple of Mant dishes are starchy seeds and growths of domesticated Mantheim autotrophs, shredded and fermented with carefully prepared strains of fungus and yeasts. Leafy vegetables are also eaten, and may either be fermented or served raw. For protein, the meat of a large domesticated arthropod called a steamroller is fermented, spices and pungent fluids are used to add to the taste. If boiled or cooked, steamroller is said to taste like lobster. Mants do not always wear clothes, but if not they will usually have a belt, harness, or bandoleer to carry things. They put on suits when necessary for protection, and decorative outfits for special occasions. These usually leave the spiricals on their abdomen bare, or at least covered with only a mesh or thin cloth to let air through. Fancy clothes involve garish colors and all kinds of extraneous adornments – fins, frills, quills, fans, tassels, glittering sequins, and plates. Each hive will have its own ensemble for special occasions, with all hive members dressing alike. Human-made materials using structural pigments are in high demand for these costumes, and are smuggled into the Zox Hierate. Outside of these special occasions, when Mants of the Zox wear clothes at all they tend to favor simple one-color jumpsuits with rugged boots. Immigrants to the Verge Republic or Gummi Space have used their new-found freedom to experiment with clothing styles, including stockings, vests, abdomen covers, and hats. Mant click music is a structured form of vocal music often accompanied by percussion instruments. In addition to clicks, it makes use of Mant stridulant chirps and buzzes. Mants use click music to accompany their ritual hive dances. The traditional sport of the Mants is competitive dancing. Each hive engages in ritual dances to out-display and out-compete the others. Depending on the style of dance, it may be only a visual display, or involve full contact ritualized combat between the hives. For the former, the hive's fancy clothes will be worn. For the latter, body armor.